Knee pain is the most common reason for requesting an appointment with an orthopedic surgeon. While many causes of knee pain can be treated without surgery, total knee replacement surgery is recommended for patients with severe knee arthritis. Total knee replacement is a long-term treatment option, in which the knee joint is replaced with a prosthetic implant, alleviating pain and restoring the knee's natural range of motion. The knee is one of the largest weight bearing joints in the body. The core structure of the knee is composed of three bones, the thighbone (femur), shinbone (tibia), and the kneecap (patella). 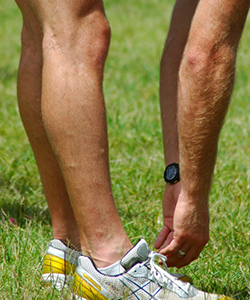 Ligaments (large bands of tissue) connect the thighbone to the shinbone to form a hinge joint and provide stability. The kneecap is attached to the front of the joint and slides along grooves on the thighbone during movement. Cartilage, a protective covering on the ends of the bones, acts as a cushion to help reduce friction and provide support. The most common cause of knee pain is osteoarthritis (also known as "wear-and-tear" arthritis), a degenerative joint disease. Any damage to the knee, by either natural friction caused by everyday use (running) or by trauma (a skiing accident), can result in the development of osteoarthritis. As osteoarthritis progresses, the protective cartilage wears away, allowing the femur and tibia to rub against one another. Symptoms of osteoarthritis often appear gradually and include severe pain, stiffness, and a decreased range of motion. For patients who do not benefit from conservative treatments, such as anti-inflammatory medications, Dr. Kastrup may suggest a long-term surgical treatment to relieve symptoms. Patients who only have damage to one section of the knee joint due to osteoarthritis, may benefit from partial knee replacement, in which only one compartment of the knee joint is replaced with a prosthesis, preserving more of the knee's natural bone and tissue. Total knee replacement is recommended for patients who have advanced osteoarthritis or are unable to complete required daily activities due to pain. During total knee replacement surgery, an incision is made over the front of the knee and the damaged bone and cartilage are removed. After removing the damaged areas, Dr. Kastrup will resurface the ends of the bones with metal and plastic, to restore smooth pain free movement of the knee joint. Total knee replacement surgery is an in-patient procedure, and most patients will typically stay at the hospital 1 to 3 days post surgery. The day after surgery, patients will begin working with a physical therapist to learn how to use their new joint, restore joint strength, and improve flexibility. Patients are typically able to return to their normal daily activities 6 to 10 weeks after surgery. However, it is frequently recommended that patients wait an additional period before returning to athletic activities, such as skiing. John J. Kastrup, MD is a board certified orthopedic surgeon who specializes in the treatment of knee pain, as well as total knee replacement. Dr. Kastrup provides treatment to patients in the Las Vegas and Henderson, Nevada area. To learn more about total knee replacement and schedule an appointment with Dr. Kastrup, contact his Henderson office.